Busy office workers like a buffet, especially when it’s good value and time saving too. And, of course, delicious. The new lunch buffet at The Square, Novotel Bangkok Silom is certainly all of those. Everyone in the Silom area and indeed all throughout the city – free parking available for even more convenience – are invited to enjoy the restaurant’s new lunch menu available Monday – Friday from 12:00 PM to 2:30 PM, starting 2nd March 2015. Bangkok Bargain Lunch is priced at only THB 169.-NETT per person, The Square’s all-you-can-eat lunch buffet features salad bar, soup station, sushi station and dessert choices. 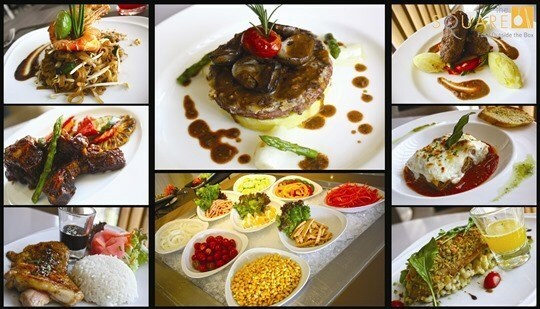 Moreover, any guest ordering an à la carte main course at THB 249.-NETT (Australian beef burger steak/ Pork sparerib BBQ/ Country dory fish steak/ Chicken Teriyaki/ Australian meat lasagna/ Australian lamb sausage/ or Phad Thai river prawn) from The Square’s lunch menu receives free lunch buffet access. Highlights on the salad bar include Caesar salad with condiment as well as fresh vegetables like French beans, capsicum, tomato and cucumber; crisp mixed lettuce selection; ham, chicken and dried chorizo; and four dressing choices. The buffet’s soup station offers spicy chicken and mushroom cream soups. Lunch is rounded out with assorted desserts, ice creams and seasonal fruits. Special offer from 2 to 31 March only: one FREE soft drink for each lunch guest.